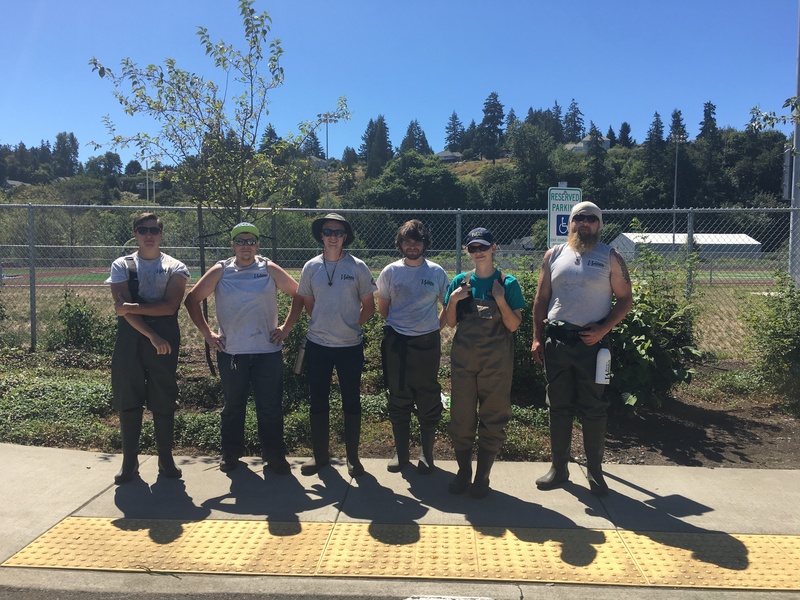 This week, the Washington Conservation Corps (WCC) crew members and local volunteers have begun work on Clear Creek along Pioneer Way, starting at 52nd street near Chief Leschi school. They will be working for approximately 12 days (Mondays-Thursdays) in August, including the weeks of August 8th and 15th. Their work is focusing on reed canarygrass removal to improve the flow and capacity of the creek/drainage ditch. 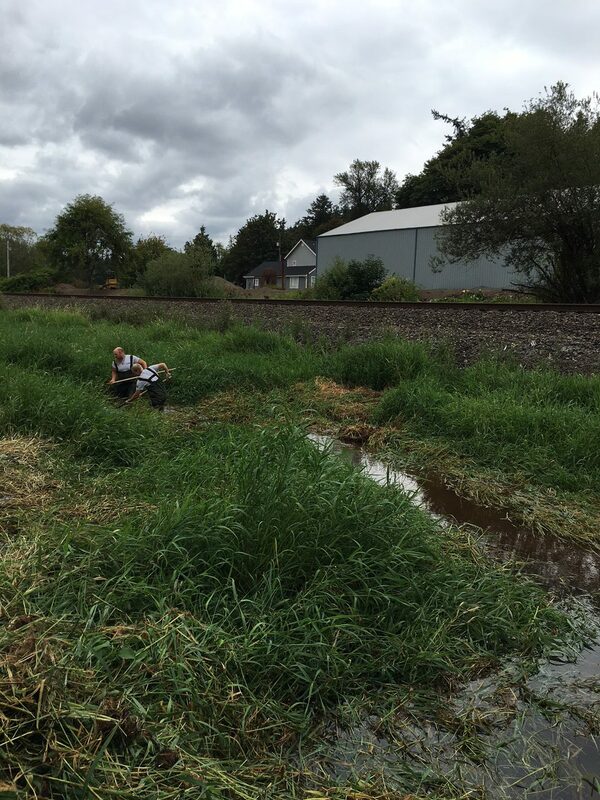 Drainage District 10 Commissioners are coordinating with the crew to plan for longer term maintenance of the creek and are considering multiple options for long term solutions for invasive reed canarygrass. 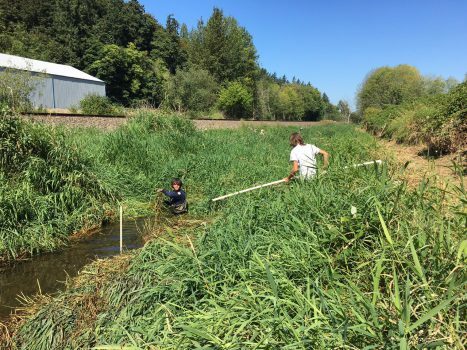 The Farming in the Floodplain Project is able to provide funding for the WCC work through the Puyallup Floodplain Reconnections grant through the Department of Ecology’s Floodplains by Design program. We are excited to be able to support on-the-ground work towards the ongoing agricultural viability of this area. We continue to seek ways to work collaboratively with other stakeholders and interests to ensure that the importance of the agricultural community is recognized and supported, and welcome input on our work. Loren Paschich, community volunteer, standing on the trail he cleared. The pile behind him is reed canarygrass the WCC crew cleared from about a 3 x 5 foot section of ditch. 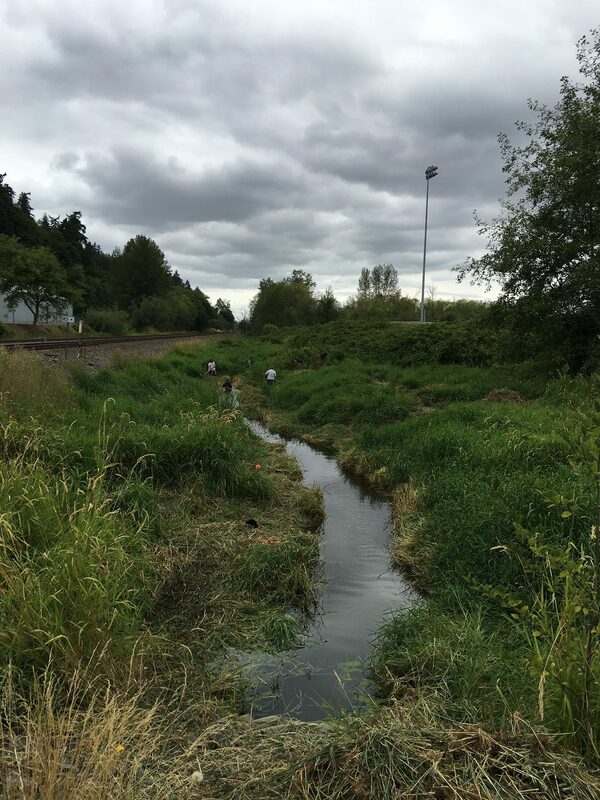 Loren Paschich has been an incredibly valuable leader in these efforts- he has assembled a team of volunteers and cleared an access path through blackberries and thick reed canarygcass along the ditch from Chief Leschi school northwest for over 1/4 mile. 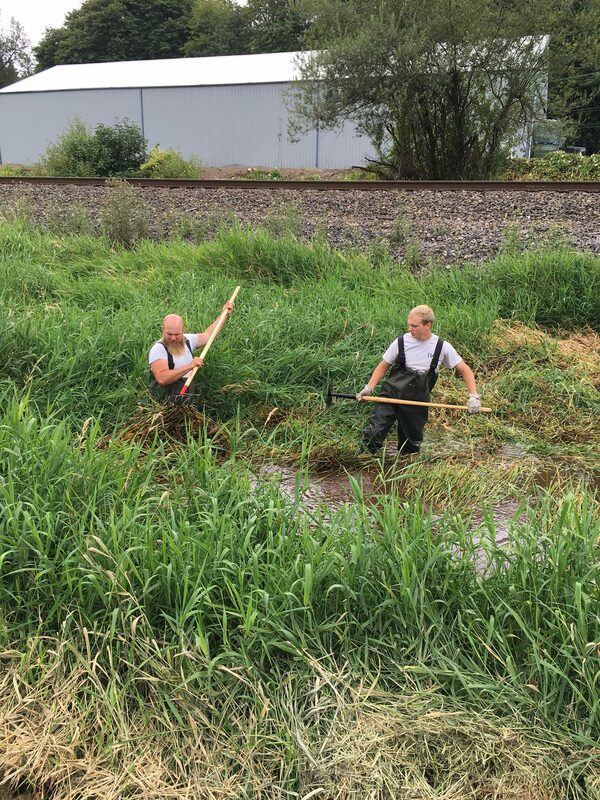 The volunteer team has been removing reed canary grass from the ditch from the northwest while the WCC crews work from 52nd street towards Loren’s team. Without Loren’s efforts, this work would take weeks longer and would not be nearly as effective. Please get in touch with him if you would like to help out for a day or two! Below are some pictures showing the ongoing work. This picture was taken looking southwest down the creek and is a visual comparison of the work before clearing reed canarygrass began. This was taken at the culvert at 52nd, looking northwest. The cleared area took two full days of work. The perpendicular cleared swath was the initial WCC test site and represents one day of work- it is approximately 30′ x 5 ‘. Two WCC crew members removing RCG. They estimate the channel is 3-5 feet deep. 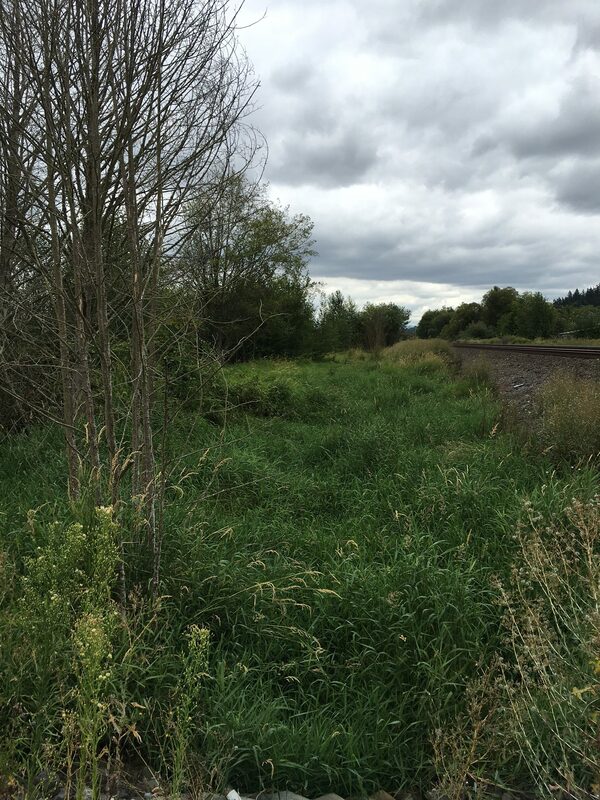 Looking southeast towards the culvert at 52nd. Two crew members removing RCG. Indicates how thick and dense the RCG root mass is. This will be an access point for RCG removal when the crews get to this section. 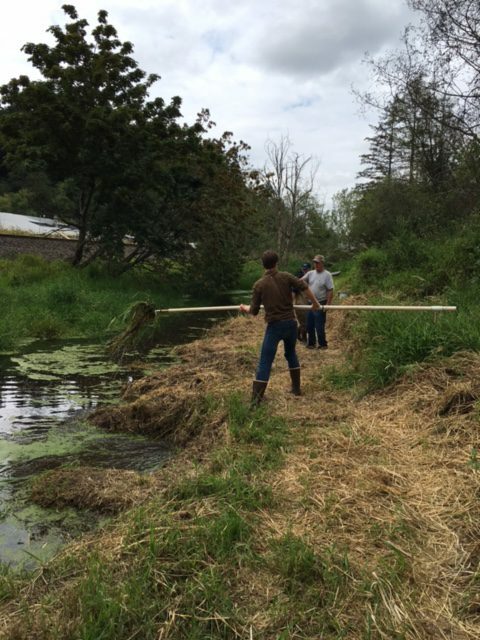 Loren and his volunteer team removed reed canarygrass northwest of this section. It is less dense in this section due to shading from the trees along the creek. Jacob Pedersen from the Pierce County Executive’s Office tries his hand at reed canarygrass removal. 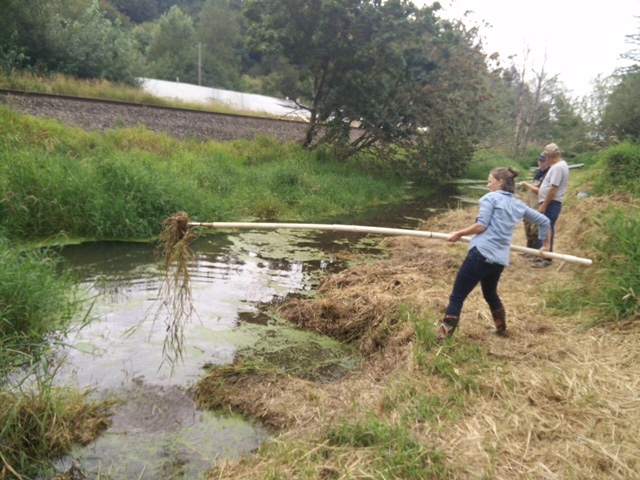 Jordan Jobe from PCC Farmland Trust tries out the reed canarygrass rake. 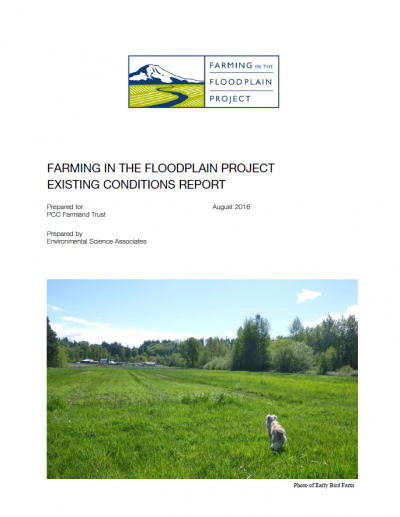 We are pleased to share the first milestone in the Farming in the Floodplain Project- the Existing Conditions Report. 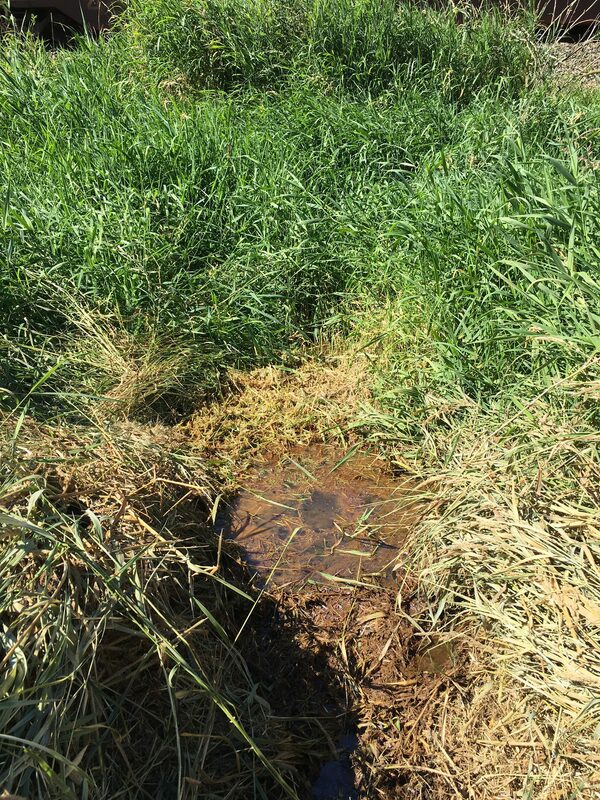 This report examines the current conditions that affect agriculture in the Clear Creek area and uses the context of “risk” to discuss what future actions might increase or decrease the risks that impact long-term agricultural viability. 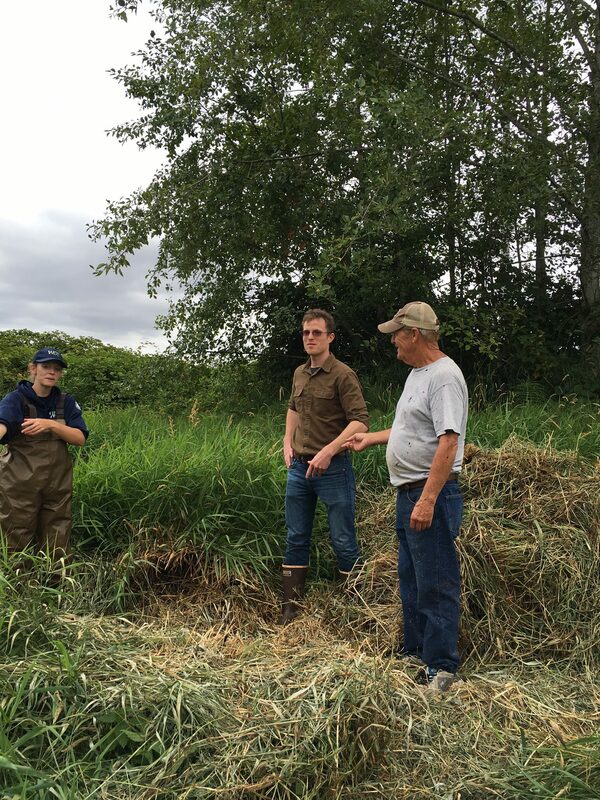 This report is the result of many months of technical research, three Technical Advisory Group meetings (including local farmers and growers), and conversations with farmers and residents in the area. The report informs the workplan for Phase 2 (August 2016-June 2017) of the Farming in the Floodplain Project, which will explore specific risk factors in depth in order to inform recommendations on addressing risk and benefit to agriculture for projects in the area. 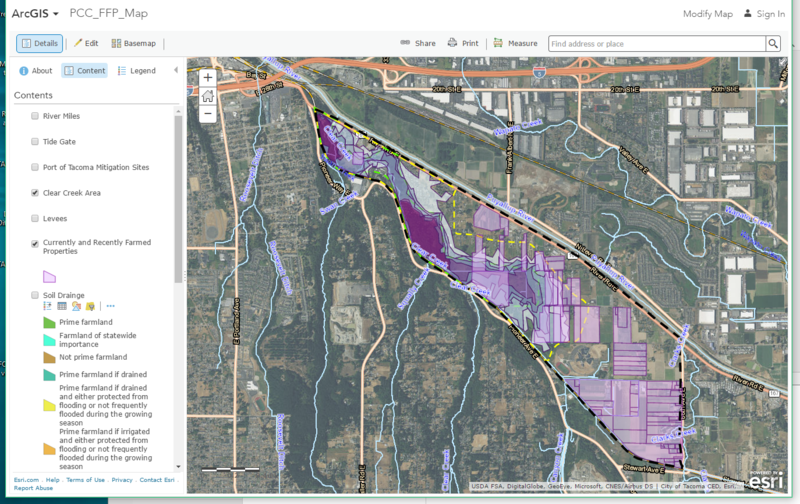 Interactive web map of the Clear Creek area showing currently and recently farmed properties as well as water levels from 2009 flooding. 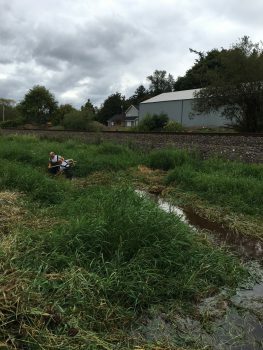 ESA (our technical contractor) has been hard at work on a lot of research related to agricultural viability in the Clear Creek area. As we all dig into understanding what information is available, and what information we need, we’ve unearthed a ton of data. ESA has compiled an interactive web map of relevant data from the Existing Conditions Report, allowing the user to view different layers and easily compare where current agricultural land is in relation to elevation, for example. This map will continue to be updated, and we hope it is a helpful resource for comparing the many maps that exist for the area. Let us know if you have any ideas for additional data to add, or ways to make this map more helpful for you. 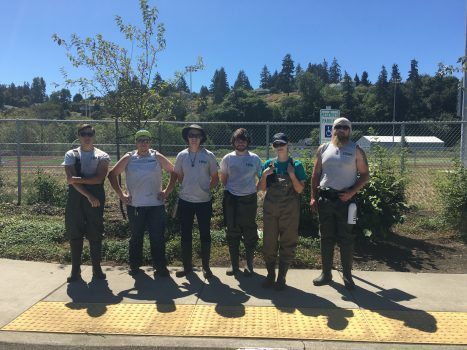 Washington Conservation Corps (WCC) Crew members will be performing drainage ditch maintenance in the Clear Creek area during the month of August. 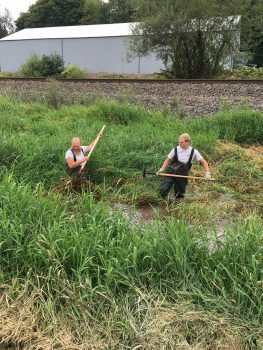 They will be focusing their efforts on reed canarygrass removal in the ditch along Clear Creek on the north side of Pioneer Way. WCC crew after their first day of work on July 28th, 2016. The WCC Crew (pictured above) will be working with Drainage District 10 and community members on these efforts. This work is being funded in part by the Farming in the Floodplain Project under the Puyallup River Floodplain Reconnection grant funded by Department of Ecology’s Floodplains by Design program. 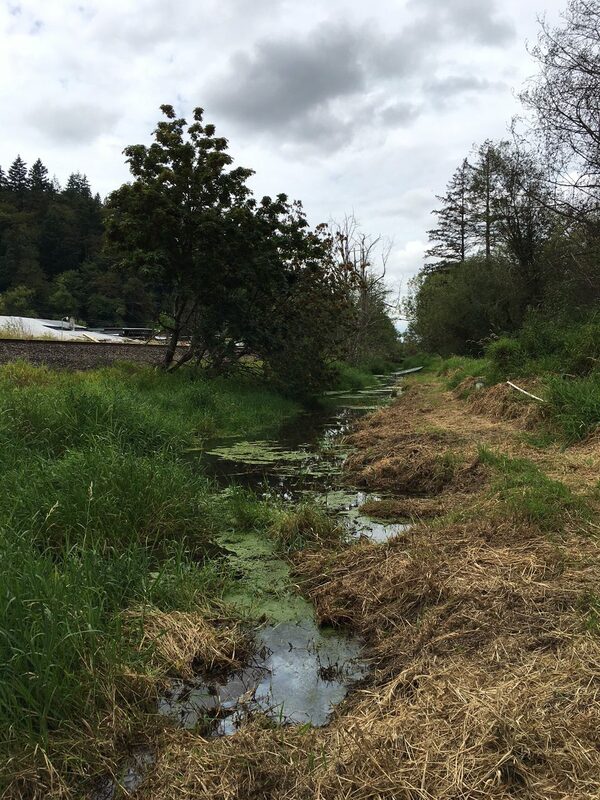 This work is the result of ongoing collaborative efforts between the Puyallup Tribe of Indians, Pierce County’s Surface Water Management, Pierce County’s Executive Office, PCC Farmland Trust, Drainage District 10, and the Clear Creek Farmer’s Collective. Based on a trial on Thursday July 28, the crew estimates that this effort will take several weeks, and hopes to start work the week of August 8. 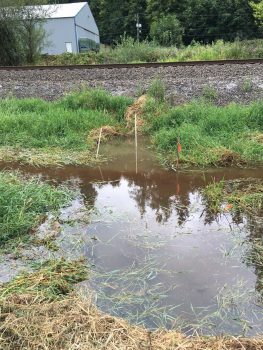 Drainage District 10 will host a public meeting regarding this work later in the month, and may be seeking volunteer labor to support the WCC efforts. ESA staff presented key findings from the public draft of the Existing Conditions Report (ECR), and discussed plans for the work plan for August 2016-June 2017. Additionally, they briefly presented a fantastic web map showing much of the data relevant to agriculture in Clear Creek. 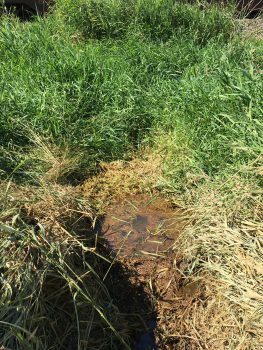 Our next TAG meeting will be in late fall/early winter and will focus on sediment issues in the Clear Creek basin. More information about the Existing Conditions Report. 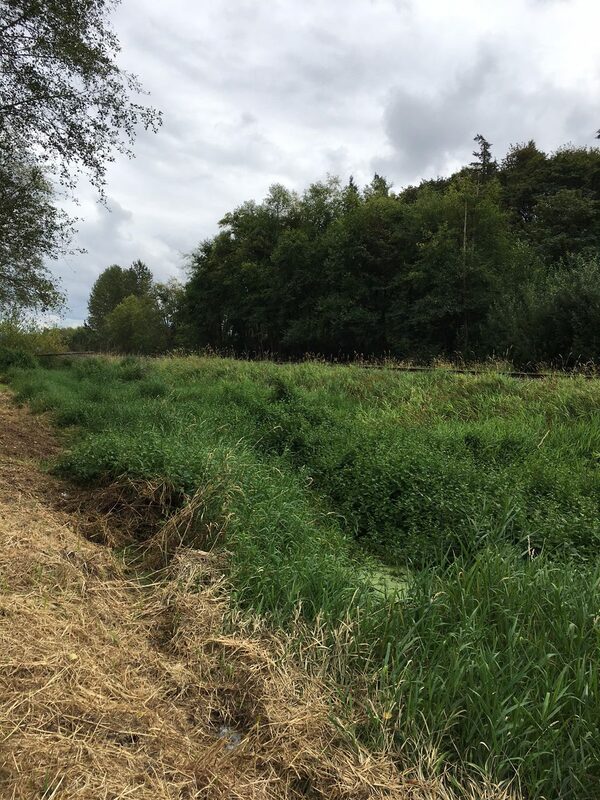 More information about the Farming in the Floodplain Project work plan for August 2016-June 2017. More information about the web map.